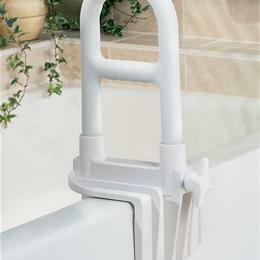 Deluxe Tub Grab Bar: Clamp Design, Including Stainless Steel Components, Stays Secure After Repeated Use. Patented Step Through Design Provides An Unobstructed Entry/Exit Path Allowing Better Hand Positioning. Bi-Level Handgrip For Maximum Flexibility And Safety. Toll Free Installation And Large Rubber-Lined Pads Won'T Mar Tub Surface. Adjusts To Fit Tubs 2.75" - 6.25" (7-16Cm) Thick. Deluxe Tub Grab Bar.